Second-alarm blaze in a vacant four-story apartment at Tyler and Wildemere. Photo by Steve Neavling. Between sunset and sunrise on Devils’ Night, fires broke out in 10 houses, one apartment and two garages. 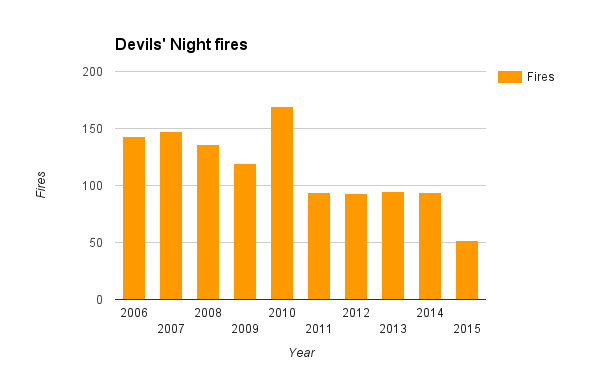 While 13 structure fires in 12 hours may seem like a lot, it’s low for Devils’ Night. In fact, Detroit may set a record for the fewest fires during the three-day Angels’ Night period that ends at midnight tonight. As of 9 a.m. Monday, about 45 fires broke out during the Angels’ Night period, according to a tally by Motor City Muckraker. Last year, the city recorded 52 fires during the same period – the lowest number since at least the 1970s. By contrast, 810 fires erupted during the three-day period in 1984, and about 180 of those blazes were in houses, garages and commercial buildings. Firefighters were so busy that houses and buildings burned for hours. The drop in fires may be attributed to fewer houses and buildings to burn, a strong presence of police, volunteers, arson investigators and ATF agents, and a disregard for the mischievous tradition. 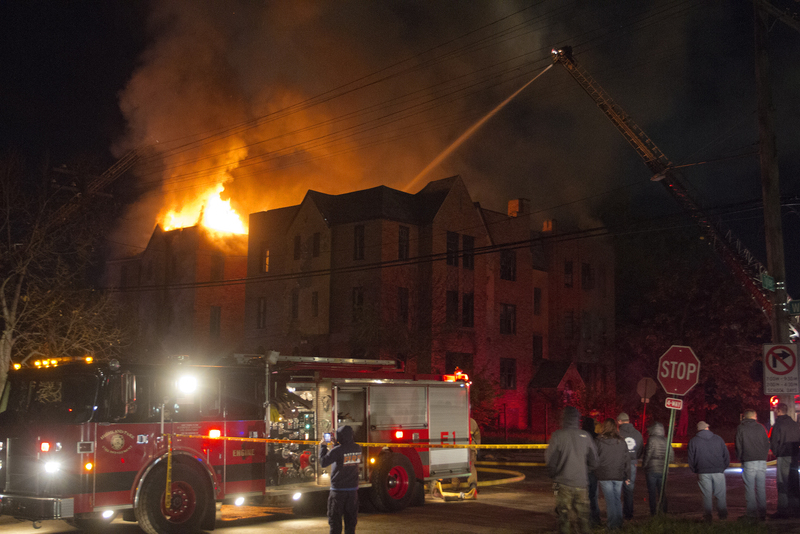 The worst of this year’s Devils’ Night fires broke out in a large vacant apartment building at Tyler and Wildemere on the west side at 3:45 a.m. It was the only second-alarm blaze. Flames tore through the roof of the vacant four-story apartment, and the fire was finally extinguished at 9:30 a.m.
House fires also broke out at Mansfield and Midland, Cherrylawn and Pilgrim, W. Fort and Waterman, 3 Mile Drive and Frankfort, W. Vernor and Livernois, Bramford and Savage, Farmbrook and Frankfort and Farmbrook and Chandler. At a house fire at Bramford and Savage on the east side at 12:45 a.m., firefighters saved a puppy, and a firefighter was injured trying to ventilate the roof. Most of the fires were suspicious or deemed arsons. We will continue to provide updates until the three-day period ends at midnight tonight.